Hanging nests, particularly woven ones are perhaps the most admirable of bird architecture. They certainly look very beautiful and most require great skill on behalf of the bird to build. The simplest hanging nests are cup-nests slung from an overhead bough by a few cobweb supports such as the nests of the Goldcrest (Regulus regulus), the Fire Crest (Regulus ignicapillus) and various White Eyes (Zosteropidae). A typical woven spotted-backed weaver nest. Photo by M-T Elliot. An interesting variation is the hanging cup nest of the Hummingbird (Planalto Hermit - Phaethornis pretrei), which has only a single support cable for its nest. To help keep it stable it has a streamer of grass and cobwebs hanging down below the nest. Other birds which build hanging nests include the Reed Warbler (Acrocephalus scirpaceus), the Fantailed Warbler (Cisticola juncidis), and the Rock Warbler (Origma rubricata), though this last species is not technically speaking a warbler. Better known than these are the hanging, often on mass, nests of the Icteridae and Oriolidae. 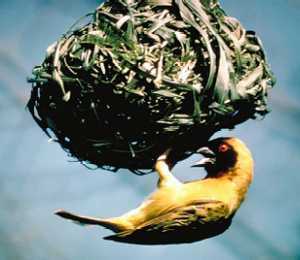 There are nearly 100 species of weaver birds renowned for their carefully woven hanging nests. These nests tend to be either hung from the tip of a branch or leaf, or suspended between two twigs. They are globular in shape with a single entrance hole. Apart form globular nests, weaver Birds also construct kidney-shaped nests and retort-shaped nests are basically globular nests with an entrance tunnel. Whatever their shape, nearly all weavers make their nests out of grass and the nests are truly woven with the bird moving from side to side, poking part of the strand of grass through the wall from the side and then pulling it completely through from the other.